Fulbright New Zealand marked its 65th anniversary last night by honouring a record annual cohort of exchange grantees. 83 New Zealand and US graduate students, academics, artists and professionals were honoured as Fulbright grantees at the organisation’s 2013 awards ceremony at parliament, which doubled as a celebration of Fulbright New Zealand’s 65th anniversary year. Fulbright New Zealand was founded by bilateral treaty in 1948 to promote mutual understanding through educational and cultural exchanges between New Zealand and the United States of America, and has since granted more than 3,000 exchange awards to citizens of both countries. At last night’s event, host minister Hon Steven Joyce and the US Ambassador to New Zealand, Hon David Huebner, both paid tribute to the Fulbright programme as a long-standing example of bilateral co-operation and an important driver of academic excellence and leadership in the two partner countries. A crowd of around 300 supporters attended to celebrate the 65th anniversary and honour this year’s grantees, including a large number of alumni from around the country. 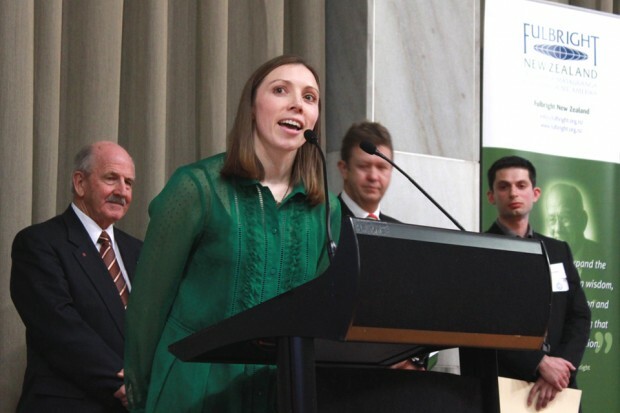 27 recipients of various Fulbright New Zealand graduate student awards were announced in last night’s ceremony. They will study or research in a wide range of fields at the US university of their choice in the coming academic year. Also recognised at the awards ceremony were ten Fulbright US graduate students who are mid-way through their exchange year in New Zealand, 46 recipients of New Zealand and American scholar awards (for academics, artists and professionals), and three participants in the Ian Axford Fellowships programme which Fulbright New Zealand administers. Fulbright New Zealand will hold further events to celebrate its 65th anniversary around the anniversary date in September, and is actively fundraising throughout the year to create an endowment fund to provide additional awards in future. Graeme Fielder from Auckland will complete a Master of Business Administration degree, specialising in entrepreneurship, innovation and technology venture growth, at Stanford University in Stanford, California. Ilsa Cooke from Waikuku Beach will complete a PhD in Physical Chemistry, specialising in astrochemistry, at the University of Virginia in Charlottesville. Sam Corbett-Davies from Napier will complete a PhD in Computer Science, specialising in the development of vision systems for personal robots, at Stanford University in Stanford, California. Joshua Foster from Wellington will complete a PhD in Psychology, specialising in cognitive neuroscience, at the University of Oregon in Eugene. Gaya Gnanalingam from Lower Hutt will complete a PhD in Ecological Science, specialising in the ecology and management of exploited decapod species, at Old Dominion University in Norfolk, Virginia. Cameron Gunn from Christchurch will complete a PhD in Electrical Engineering, specialising in the design of control systems for guiding medical decisions, at the University of California, Los Angeles. Samantha Hill from New Plymouth will complete a Master of Science degree in Sustainability Management, at Columbia University in New York. Sunkita Howard from Punakaiki will research the use of weak electricity to deter shark bycatch from longline fishing gear, at the College of William & Mary in Gloucester Point, Virginia, towards a PhD in Zoology from the University of Otago. Ani Kainamu from Auckland will research indigenous and Western natural resource management practices for waterway habitats of wild food species, at Hawai‘i Pacific University in Honolulu, towards a PhD in Environmental Science from the University of Canterbury. Joshua Krissansen-Totton from Auckland will complete a PhD in Earth and Space Sciences and Astrobiology, specialising in the evolution and habitability of planetary atmospheres and their interactions with the biosphere, at the University of Washington in Seattle. Chuan-Zheng Lee from Auckland will complete a Master of Science degree in Electrical Engineering, specialising in telecommunications, at Stanford University in Stanford, California. Isaac Manuel from Christchurch will research distributed control systems and estimation for autonomous vehicles, at a yet-to-be-determined US university, towards a PhD in Engineering from the Australian National University. Kelly O’Connell from Red Beach will complete a PhD in Mathematics, specialising in functional analysis, at Vanderbilt University in Nashville, Tennessee. Sarah Poole from Pihama will complete a PhD in Biomedical Informatics, specialising in the use of data from medical records to improve therapies, at Stanford University in Stanford, California. Charlotte Till from Dunedin will complete a PhD in Anthropology, specialising in the migration and impacts of Homo sapiens as evidenced in ancient DNA, at Arizona State University in Tempe. Dmitry Volynkin from Auckland will research the design and performance of steel frames in earthquakes, at Portland State University in Oregon, towards a PhD in Civil Engineering from the University of Auckland. Kate Yesberg from Wellington will complete a Master of Laws degree in Environmental and International Law, specialising in regional environmental governance and regulation of extractive industries, at New York University. William McVitty from Palmerston North will complete a Master of Engineering degree in Civil Engineering, specialising in structural and earthquake engineering, at the University at Buffalo in Buffalo, New York. Horiana Irwin-Easthope from Nuhaka/Tikitiki will complete a Master of Laws degree in Environmental Regulation, at Harvard University in Cambridge, Massachusetts. Eleanor Bishop from Wellington will complete a Master of Fine Arts degree in Theatre Directing, specialising in the creation of original contemporary performance, at Carnegie Mellon University in Pittsburgh, Pennsylvania. Fran Gourdie from Hamilton will complete a Master of Laws degree in Human Rights and International Trade Law, at Columbia University in New York. Charlotte Greenfield from Wellington will complete a Master of Science degree in Journalism, specialising in investigative journalism, at Columbia University in New York. Ben Prewett from Auckland will complete a Master of Laws degree in Corporate Governance and Practice, specialising in corporate governance and international dispute resolution, at Stanford University in Stanford, California. Joshua Tait from Christchurch will complete a PhD in History, specialising in the American conservative movement, at the University of North Carolina at Chapel Hill. Simon Todd from Christchurch will complete a PhD in Linguistics, specialising in the intersection between language variation and change, and computational methods and models, at Stanford University in Stanford, California. Sally Trafford from Auckland will complete a Master of Laws degree in Taxation Law, specialising in economic inequality and tax reform, at Harvard University in Cambridge, Massachusetts. Kate Yang from Auckland will complete a Master of Public Health degree in Clinical Effectiveness, specialising in statistical and epidemiological methods for translating scientific research into clinical relevance, at Harvard University in Boston, Massachusetts. 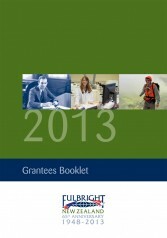 For information about this year’s other Fulbright grantees see our 2013 Fulbright New Zealand Grantees Booklet.